Sigh, Monday. Our weekdays look a lot different now that school has started. Normal weekday meals usually consist of something hastily thrown together before we are out the door for our next activity. Rarely do we get to sit down together, let alone connect as much as I would like. But family meals together are not just important for our sanity; they are critical in this household. This past weekend, I was reminded just how much we LOVE our weekend family breakfast traditions. Today I’m sharing how to make family weekend breakfast special and why we NEED these traditions for a happy and healthy family. It may seem silly, but I have to constantly remind myself and my family that this is NOT like our usual week routine. Always rushing, always reminding certain little ones to chew or behave is the norm…but NOT during the weekends. I let the kids graze, relax, and have fun. It is the weekend after all! We all slow down and just take in the time we have together. Goodbye, cartoons! Sayonara, social media! Do you feel like electronics are zapping your brains too? Weekends are the perfect days to unplug from the world of technology and focus on more important things, like our family. You’ll be so glad that you did this. It’s our little weekend family tradition. Little feet moving around the house. Little hands grabbing the nearest step stool. Little giggles as they set the stools down right at the kitchen counter. I grab our favorite weekend breakfast indulgence from the fridge. 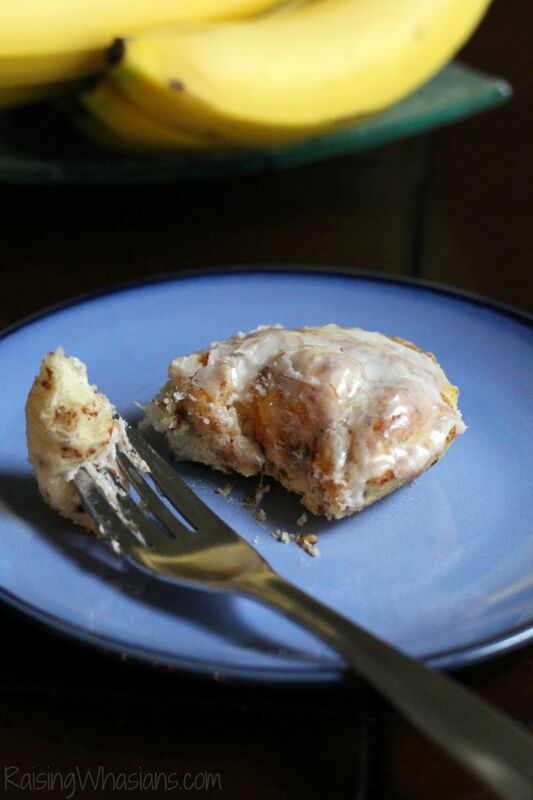 Pillsbury Cinnamon Rolls. Smiles and cheers build as we hear that familiar “popping” noise of the can. My little kitchen helpers delicately place the rolls in the pan. They are the cooking experts today. Into the oven they go as the house begins to fill with the delightful smells of cinnamon. Perfect for fall! And the best part? The icing, of course. No weekend breakfast treat is complete without the ooey gooey icing. And my master chef son enjoys icing every last corner. Within in minutes you can find the whole family crowded around the breakfast table. Catching up on our week, slowing down from our busy lives, laughing and reconnecting….I wouldn’t trade these family moments for anything. We don’t let our busy weeks get in the way of our family time. I look forward to special family weekend breakfasts every single week. In fact, I count down the days. Making sweet family memories? Absolutely! 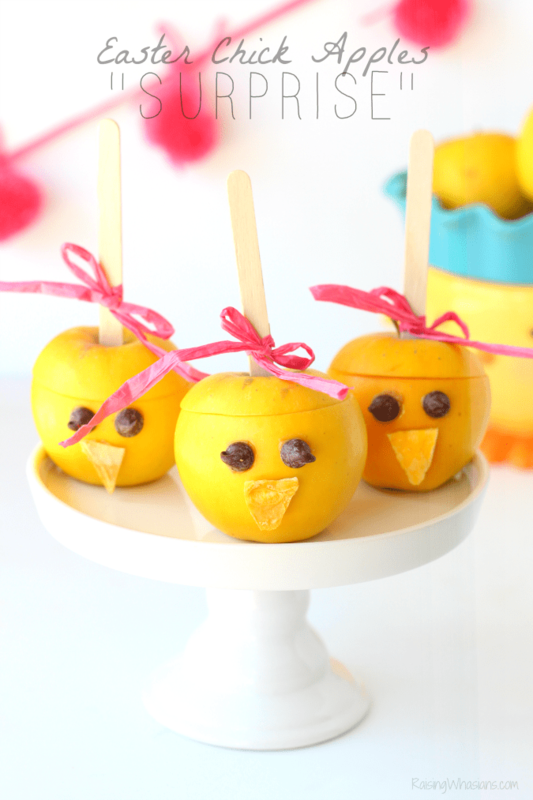 Ready to make sweet weekend memories with your family? 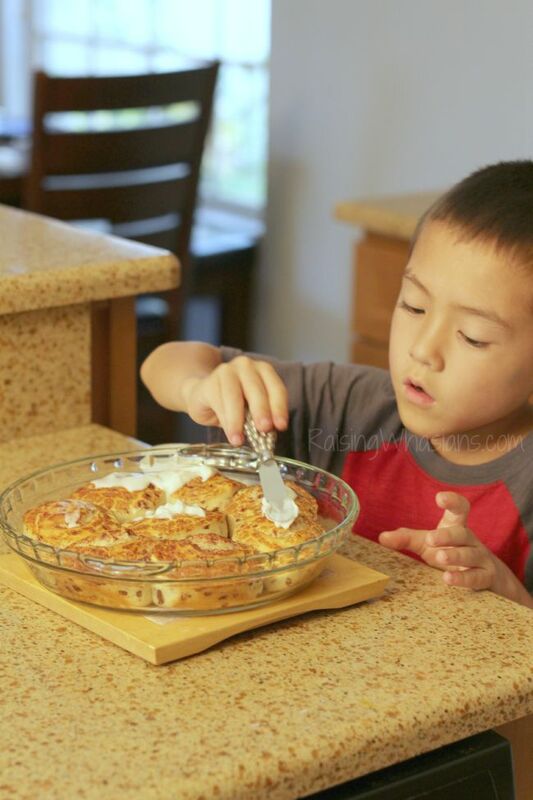 Head over to Pillsbury.com for more family breakfast inspiration, recipes and more! 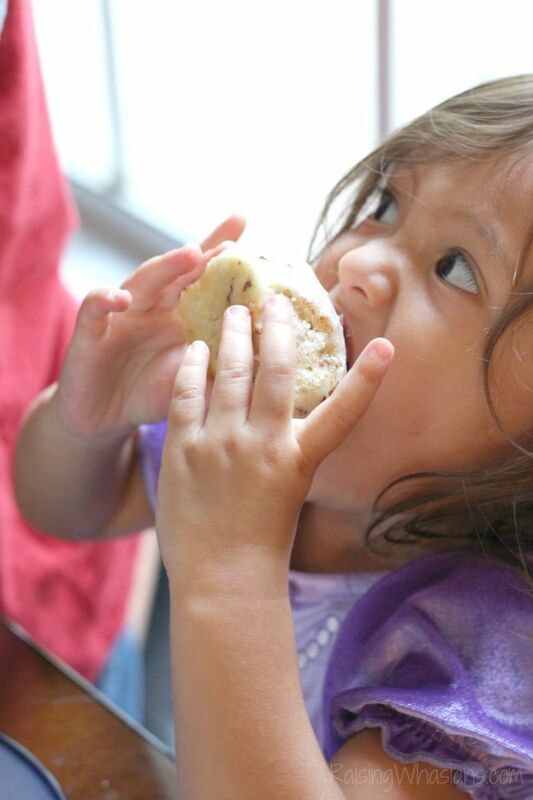 Follow Pillsbury via Facebook, Twitter and Instagram. And stay connected with your family weekend breakfast moments with hashtags #CinnamonRollSaturday and #CinnamonRollSunday. 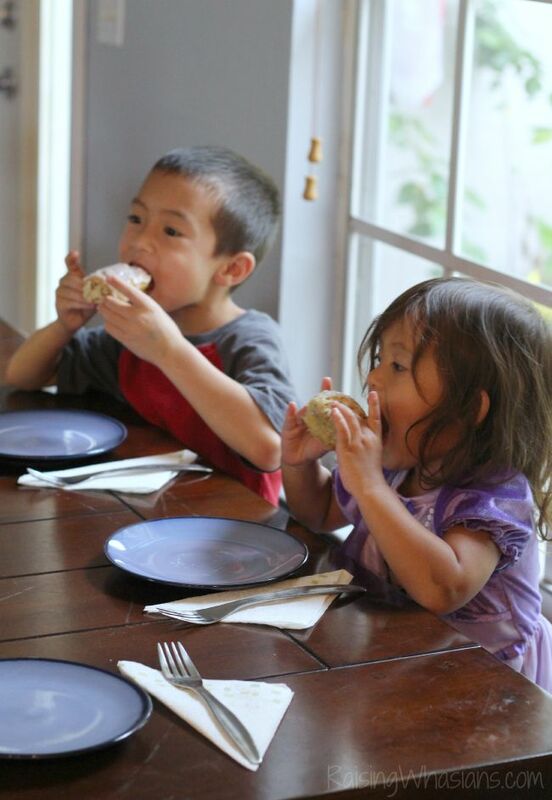 What weekend family breakfast traditions are important to you? 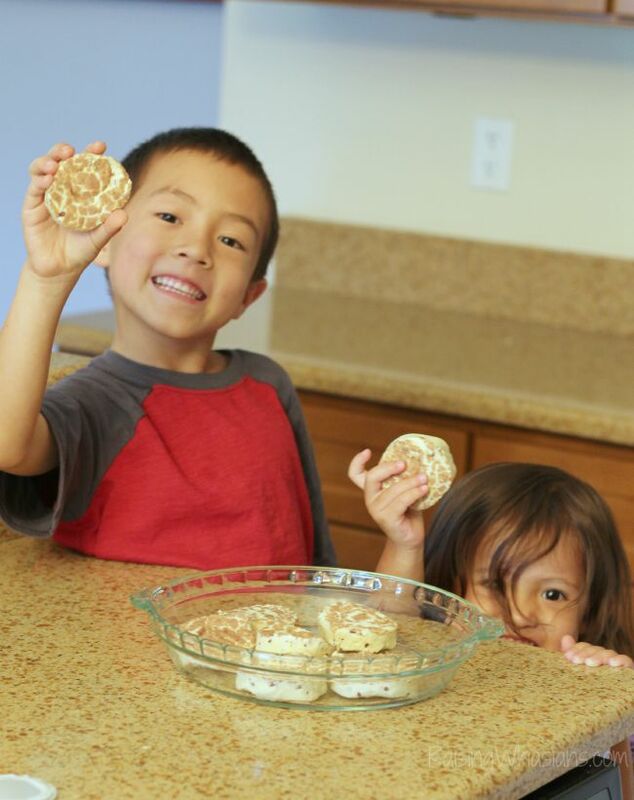 Be sure to follow Raising Whasians via Facebook, Twitter, Google, Instagram, Pinterest and YouTube for our family moments, recipes, kid crafts and more. How fun! Any extra family time is worth the extra effort!! We always make a big breakfast on Sunday mornings. My mom always did that with me & my siblings, so I want to carry it on. I love these ideas! My family is always on the go, so we try to make weekends as special as possible. It’s the only time we’re all in the same place! We love sitting down together and enjoying breakfast. I need to make my boys some cinnamon rolls once it starts getting cooler out. They will love them! Making a meal together always makes it feel more special. We used to all make dinner together once a week. Now the kids have moved out, we still try to cook together for holidays. These are all great ideas. I know it’s hard for families to find the time to spend together and it’s very important to set aside the time to do this. Thanks for posting! Those cinnamon rolls look so yummy. We usually sleep in on Sundays and once we are all up we go out for brunch. Maybe this Sunday we will stay home and make brunch together. Slowing down on the weekend is our biggest help. It pays off to renew both our bodies and our time together! This is a great thing to do! We also like to do special breakfasts and spend much more time with the children. Often we take them to orchards to pick fruit, fairs, whatever is seasonal. I think working together in the kitchen is a great way for a family to connect. Plus, my 5 year old is more likely to eat foods he helped prepare. It’s a win-win!! Weekends are all about family time. Love having the grandkids over to help in the kitchen. So many memories have been made. I’m liking your ideas! We need to have some more breakfasts like that around here! I knew it was a good day in my house when we got cinnamon buns before church on Sundays! 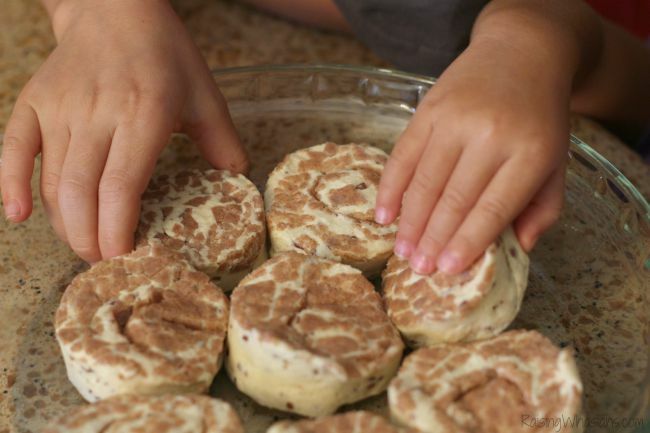 My boys love when we make cinnamon rolls. They do make breakfast fun. My biggest rule is no electronics of any kind during meals. These are such great tips! Saturday morning breakfast is so important to my family. These are memories that your kids will treasure forever. By the way, your kids are the cutest! We are always on the go even on most weekends but it is nice to sit down and enjoy a meal together. Love this! Our weekend breakfasts are usually fast paced and really chaotic. 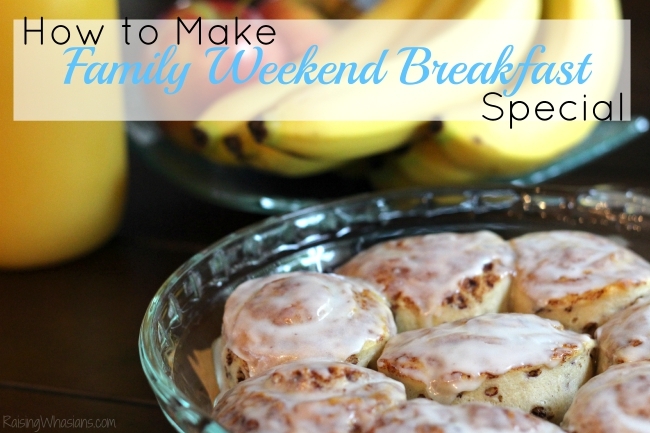 I will be taking these tips and having more special weekend breakfasts with my family! I cherish our time together on the weekends. Making breakfast together is one of our favorite things to do on a lazy day. this is a good idea to let the kids help make. looks like fun! I wish i was more of an early morning person. I remember my family having big family breakfasts on Sundays as a kid. I actually started learning to cook by helping with the Sunday breakfast. 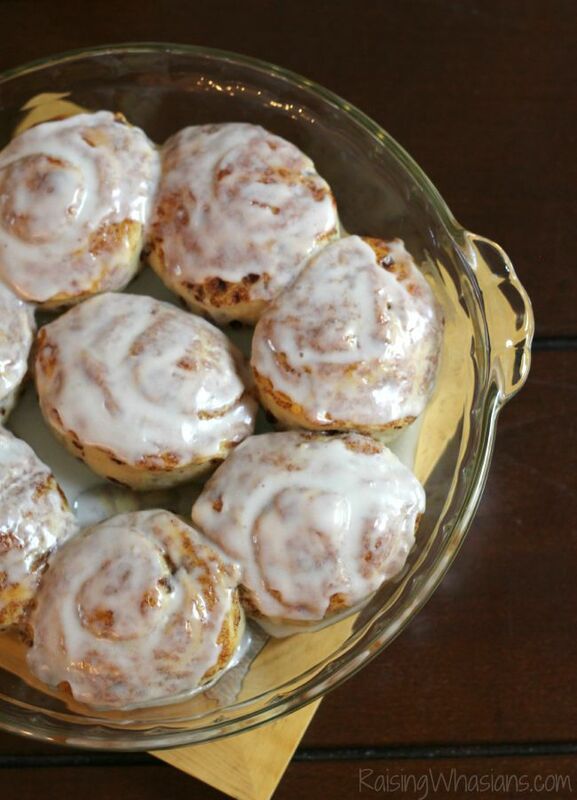 We have cinnamon buns almost every weekend. The ids just love them! I love Pillsbury Cinnamon Rolls! Sounds like your family had a blast! 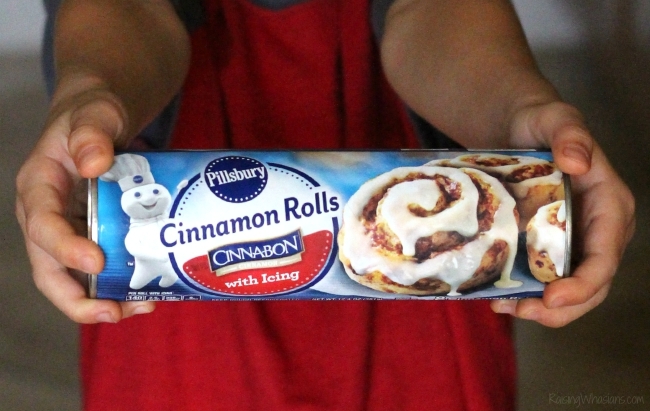 I love to make Pillsbury Cinnamon Rolls on the weekend. Everyone tends to stay around the breakfast table a little longer….talking and laughing together.